Ticketing kiosks can be deployed in different form factors and dispense tickets in different forms. Kiosk thermal printers can print tickets on standard or preprinted stock. Preprinted stock allows you to use complicated designs and multiple colors on the ticket stock while still be able to print seat or date data while dispensing. Standard stock is cheaper and flexible, but you are limited with ticket appearance options. Preprinted complete tickets can also be dispensed along with change using kiosk cash dispensers. The payment flexibility of this set up broadens ticketing kiosk applications. 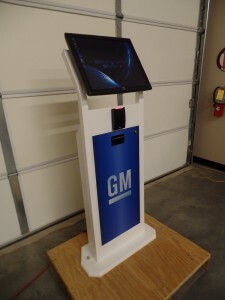 Ticketing kiosk form factors include free standing, wall mount, and custom mounting. Custom mounting is the most expensive and requires modification of walls, building of booths, or special countertops. The custom mounts are preferred on very high volume applications that are continually used. A free standing kiosk allows you more options in placement and lower up-front costs. Many free standing ticketing kiosks can be moved to different venues as needed. Wall mount ticketing kiosks are the middle ground between custom mounting and free standing. Although they require permanent mounting, use of surface mounting is relatively inexpensive. The best kiosk designs are collaborations between the end user and the kiosk manufacturer. Call to discuss your application to get the kiosk that meets your needs and budget. We have added a new frame style to the Bruin Kiosk family of kiosks. The new style is our RA kiosk. The first iteration of the RA kiosk is a 32″ landscape orientation touchscreen. The RA kiosk has very simple lines with rounded corners and a unique “layered look” to the front. The kiosk has a removable rear access panel and can be configured with a PC or media player to drive content. Options include custom graphics and speakers. The RA kiosk joins our two other styles of digital signage/large format touchscreen kiosks. The DS and LR kiosks can be viewed on our website. The kiosk will be rolled out into the major airports in the US during the next few months. Look for updates on this roll out in future posts. Custom Designed or a Standard Kiosk? 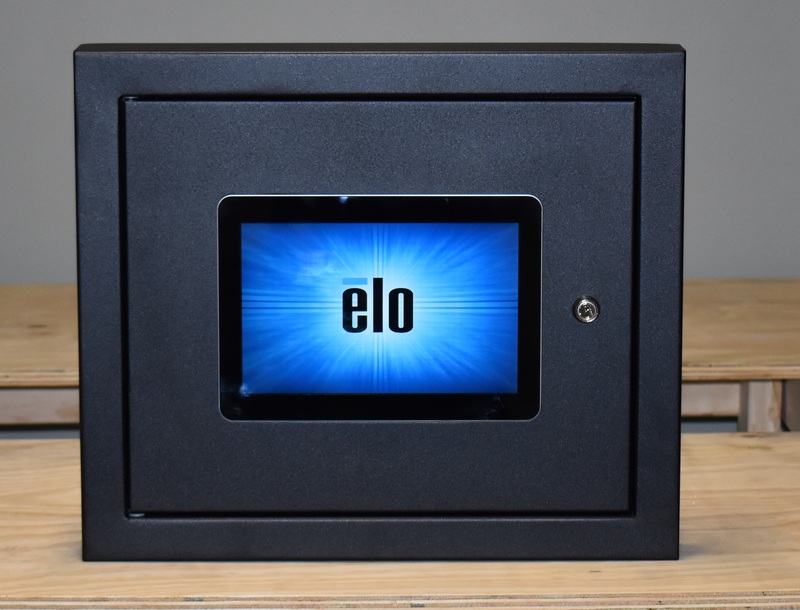 The kiosk enclosure you select for your product must be large enough to hold the components required to provide functionality and be safe. After you have satisfied those two requirements, you then want to decide on the “look” of your kiosk. Kiosk companies approach this part of the design process three different ways. One Look-Various Sizes -A simplistic version of design is to offer one style of kiosks. The kiosk may vary in size depending on the components or size of the touch screen, but all kiosks look the same. Companies that employ this strategy reduce their design costs. The negative side of this strategy is not all kiosks are used in the same style of locations. A kiosk that is deployed in a prison should not look like a kiosk deployed in a casino. Beauty is truly in the eye of the beholder and the end customer may have a different opinion than yours of what is the best look for a particular application. Most kiosk companies employ the following strategy to combat this issue. Multiple Standard Designs-The use of multiple standard designs gives customers a chance to choose what type of kiosk they want to purchase. We don’t all drive the same car. We like to choose a car that appeals to us. Multiple designs allow the customer to choose what they like, yet take advantage of standard kiosk pricing structure. What if you don’t find what you like in a standard list of kiosks or you want something that is unique to you? Custom Design-Custom design broadens the “choices”! I want a kiosk like my competitor, but I don’t want it to look like their kiosk or I like this model, but I want more screen privacy or I have an artist rendering of what I want my kiosk to look like…can you make this? These are just some of many different reasons to go the custom route. The down side of the custom route is most companies charge exorbitant fees for custom designs and the lead time for the first product is almost always measured in months and not in weeks. At Bruin Kiosk we offer multiple standard kiosks and we offer custom design. We don’t charge design fees for custom orders placed by repeat buyers or for large one time orders. Our design is done in house, and we try and minimize the long wait for custom orders. Please review our standard designs on our website and see if we have a style that fits your needs and taste. If not, give us a call and we can discuss a custom project for you. 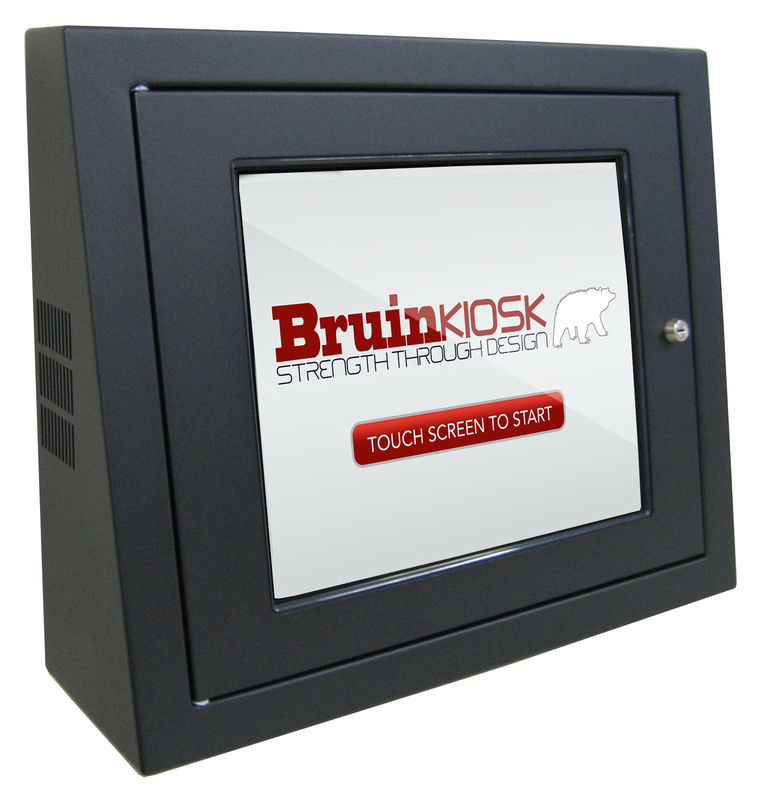 Bruin Kiosk makes a complete line of prison or jail kiosks. These kiosks are used to manage inmate funds and can also be used for commissaries and email applications. 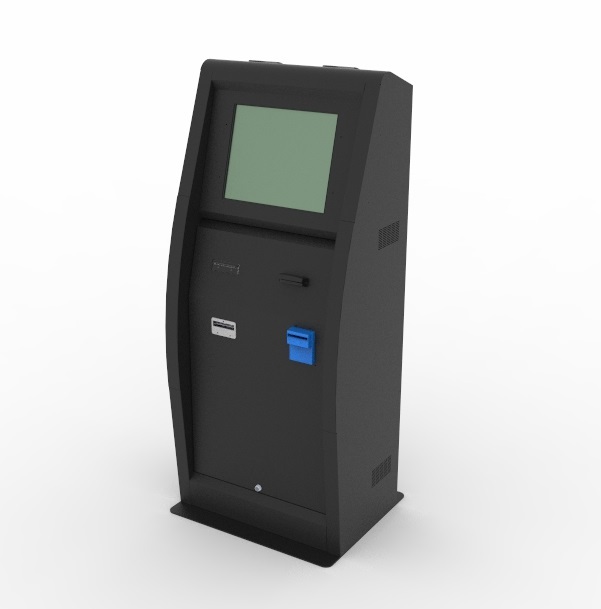 Our correctional kiosks feature a rugged design that is easy to service. We use full computers instead of motherboards like many of our competitors. We also feature full size 19”monitors on our correctional kiosks. Our computers and monitors are high quality and come with three year warranties. The most common correctional kiosk is the booking kiosk. The booking kiosk is used to deposit inmate funds. The booking kiosk usually features a bill and coin acceptor, touchscreen monitor, receipt printer and computer. Options can include a magnetic stripe card reader and security camera. We also manufacture kiosks for large institutions which feature bulk coin and/or bulk note acceptors to handle large amounts and help speed the booking process. The kiosk can be fitted with a custom graphic overlay to brand your kiosk and provide use instructions. Dual exterior door locks and inside locking security doors for the coin/bills are standard. Lobby kiosks are used by visitors to deposit funds in inmate accounts. Lobby kiosks have many of the same components as the booking kiosk. Our standard model includes bill acceptor, touchscreen monitor, receipt printer, magnetic stripe reader, and computer. Options include custom graphic and security camera. Coin acceptors are not usually put in lobby kiosks. Dual exterior door locks and inside locking security doors for the coin/bills are standard. Inmate kiosks are used by the inmates to order commissary items and/or send/receive emails. Our inmate kiosk features a sloped front for easy use and viewing. 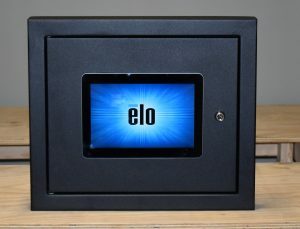 Our standard inmate kiosk comes with a touchscreen and computer. Our inmate kiosk features a removable front door which holds the computer and touchscreen. The exterior cabinet is light and has pre drilled standard mounting holes. The advantage of this design is it allows for easy single person wall mounting. The wide bottom of our sloped style allows for this unit to be table or shelf mounted as an option. We also have a keyboard option for inmate email. Our windows based systems can be used with all the major prison software systems. If you don’t have a software system or commissary vendor, we have partners that we would be happy to recommend. There is a lot of confusion concerning kiosk design and what constitutes ADA compliance. The confusion comes into play when people reference the design standards for ATM’s and apply them to self- service kiosks. The Department of Justice published updated ADA design standards for accessible design in 2010. Section 707 of that standard has an extensive list of rules for ATM design. However, those standards do not apply to kiosks. There are design regulations for kiosks purchased by the federal government and they are usually referenced in quote requests. Section 707 makes this point clear. Advisory 707 Automatic Teller Machines and Fare Machines. Interactive transaction machines (ITMs), other than ATMs, are not covered by Section 707. However, for entities covered by the ADA, the Department of Justice regulations that implement the ADA provide additional guidance regarding the relationship between these requirements and elements that are not directly addressed by these requirements. Federal procurement law requires that ITMs purchased by the Federal government comply with standards issued by the Access Board under Section 508 of the Rehabilitation Act of 1973, as amended. This law covers a variety of products, including computer hardware and software, websites, phone systems, fax machines, copiers, and similar technologies. The fact that ATM standards don’t apply to kiosks doesn’t totally release our industry to ignore ADA concerns. Reasonable accommodations may be ambiguous, but nobody wants to be a part of defining it in court. Kiosks are deployed to serve a purpose. Smart design and good business practice should drive us to make kiosks accessible to as many people as practical. Using the reach guidelines from the ATM standards is a good starting point when designing a kiosk and software system. Let us first review reach standards for ATM’s. Reach standards give both a maximum and minimum range where interaction with an ATM must take place. This standard is set with forward wheel chair access to the machine in mind. This standard is good as long as you don’t have to reach forward more than 20 inches to touch the machine. There is a sliding scale that reduces the “15 to 48” window if you have an obstruction. Typically kiosks are flat in the front so any reach obstruction is caused by a keyboard or a tilted screen. The vast majority of those obstructions are far less than 20”, so let’s concentrate on the “15 to 48” window. The low reach limit seldom comes into play with kiosks. Most components have user interaction with the top of the component (like cash insertion into a validator) which makes compliance to the 15” standard easy to design around. The most common issue with compliance is with the 48” maximum height. Kiosks usually have touchscreens that are much larger than found on ATM’s. The inherent size increase of these large touchscreens raise the height of kiosk as compared to their ATM brethren. These large touchscreens are difficult to interact with for a standing person if you drop the screen to a low height. So how do we make a kiosk reach accessible to wheelchair access and make it practical for standing interaction? There are different ways to attack this issue. Use a keyboard or ADA compliant access device positioned below the screen to allow seated users to interact with the software. Use software interaction “buttons” in your program that is positioned at the bottom of the touchscreen. The seated user can look at a screen that is higher than the 48” reach standard, but they only need to interact with the lowest part of the screen which would be positioned at a compliant level. Tilt the screen back and lower the kiosk. A pedestal style kiosk can significantly lower the height of the kiosk to meet a lowered total height. At the same time, the pedestal tilt allows for a standing user to interact with the kiosk without straining or contorting your body. People who are over 6 foot tall and have interacted with some poorly designed ATM’s are well aware of what that entails. Our AD kiosk as an example of a model designed with both reach compliance and ease of use for standing interaction. We know that ATM design standards don’t apply to kiosks, but doesn’t it make sense to go beyond “what is required” and attempt to reach the widest possible audience with your kiosk deployment. Please contact Bruin Kiosk and let us help you achieve those goals.